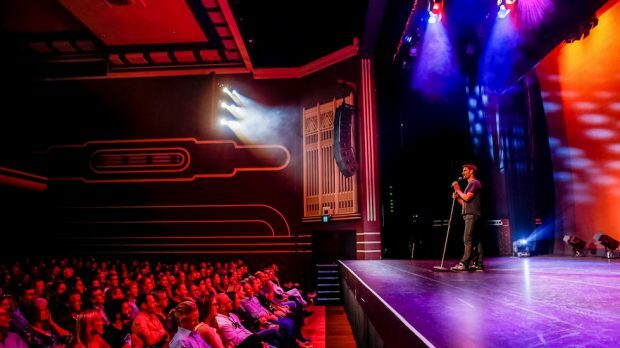 Perth Comedy Festival have announced the first round of comedians joining us for 2019’s festival, going down from Monday, April 22 until Sunday, May 19 at The Regal Theatre and The Astor Theatre. Internationals Stephen K Amos and Daniel Sloss (pictured, arguably best of the fest this year) are returning to the festival, alongside Nazeem Hussain, Tahir, The Motherhood, Simone Springer and Colin Ebsworth. Stephen K Amos is no stranger to Australia, or Perth, and will be bringing classics and new material to the Regal Theatre from Thursday, May 9 until Saturday, May 11. Daniel Sloss returns to our shores following his successful Netflix specials, bringing dark humour and cynicism with his new show X which will hit the Regal Theatre on Saturday, May 4. It’s been a huge year for Nazeem Hussain; he became a dad, his sketch show Orange is the New Brown began airing and he recorded his first Netflix special. Twice nominated for a Helpmann Award for Best Comedy Performer, he’ll be bringing his solo show, Basic Idiot, to the Regal Theatre. Best known for his portrayal of Habib in the hit comedy TV show Fat Pizza, Tahir is also the creator of Here Come The Habibs and has featured in Housos, Swift and Shift Couriers and The Footy Show. He’ll be exploring the stupidity of humans in his upcoming show, You Had ONE Job! at the Astor Theatre on Friday, May 3. The Motherhood, which is a collective of comedians made up of Emma Krause, Pony, Simone Springer and Lucy Ewing, will be presenting Surviving The Circus in the Regal Theatre Chorus Room from Thursday, May 9 until Saturday, May 11, whilst group member Simone Springer will also present a solo show in the Chorus Room from Thursday, May 2 until Saturday, May 4. To round out the first announce, stand-up comedian and professional joke writer Colin Ebsworth returns for another festival performance with his show Ebz Dispenser on Thursday, May 2 and Friday, May 3 at the Regal Theatre Chorus Room. Perth Comedy Festival runs from Monday, April 22 until Sunday, May 19. Further acts announced in early December with the full line-up revealed in March 2019.